The sweet little Sebastopol gosling, we picked up on the way to a sheep show last March, is all grown up now. How do we know this? 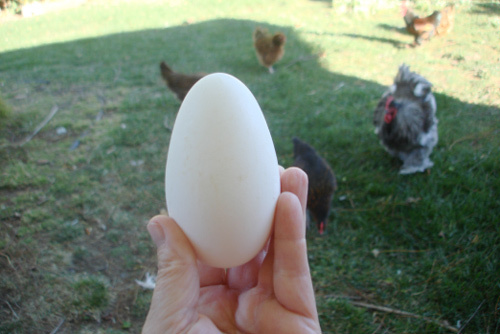 Well, we found this gigantic egg outside the barn yesterday morning. And I do mean gigantic. Poor little girl…the egg measured just over 3 ¼-inches. OUCH! Brianne was so excited when she bounded through the back door clutching Sophia’s inaugural egg. But, our delight was tempered by the knowledge that even though Sophia is laying eggs there won’t be any goslings running around the farm. Her hatch mate and gander friend (Sebastian) died of unknown causes shortly after we brought them home. They were still in the brooder at the time. When I checked on them in the morning all was well, but in the mid-afternoon I walked by the brooder box and Sebastian was cold and stiff. We talked to the breeder and they had no idea either why he died, but they were kind enough to replace him. The only challenge… Sebastopol geese have a limited breeding season, just a few weeks from January – March. We have a replacement on order, but can’t pick him up until a sheep show in March takes us that far north. I’m not even sure I want to replace him though. My original idea was to breed the geese and sell the off-spring, but there doesn’t seem to be a viable market for fancy geese in my area and one prima donna on my place is enough. An alternate plan would be to use the credit I have with the breeder and buy meat ducks which we could put in the freezer or sell. We do have a market for meat ducks. Not yet sure what I’ll do. Fortunately there’s still time.